Mid-semester break is over but the first week resuming back to lectures at the University of Otago wasn’t turned out to be an exhausting one. The live streaming sports at school’s common had made an energising kick off. They were rugby matches on screens and were definitely easing the Monday blue. I am not quite a sports fan indeed, but kind of influenced by the contagious sports fever. I do play sports sometimes but am not into any particular one. I feel like people in New Zealand love sports so much, tramping and camping in outskirts of town, or ball games and jogs around campus. Amongst all, rugby is the most popular. We can definitely say that rugby is the national sport of New Zealand. The glory of the national men’s team, the All Blacks, with their symbolic dance before every game they play, the Haka, has created a unique identity for the nation. Not sure if rugby is originated here, Haka is a traditional war dance of the indigenous Maori. Firm steps and loud roars, aggressive but decent. Whenever there is a rugby match, the whole country gets ready for it. Buses have their destination sign changed to “Go All Blacks!”. Boutiques get their display models dressed up in black outfits with the official All Blacks beanie and scarf. Flags are up on light poles on every street, and even banks and pharmacies put up posters and supporting slogans at their entrance. The vibes are strong and most Kiwis embrace the rugby hit. I haven’t yet managed to buy a ticket for an All Blacks match successfully as tickets often sold out outrageously fast. I have made it to a Super Rugby match though, to support our Dunner team. Super Rugby is an international men’s rugby league, tournaments among south hemisphere countries such as New Zealand, Australia, South Africa and Argentina, plus Japan. The Kiwi teams include the Chiefs (Auckland), Blues (Hamilton), Hurricanes (Wellington), Crusaders (Christchurch) and Highlanders (Dunedin). 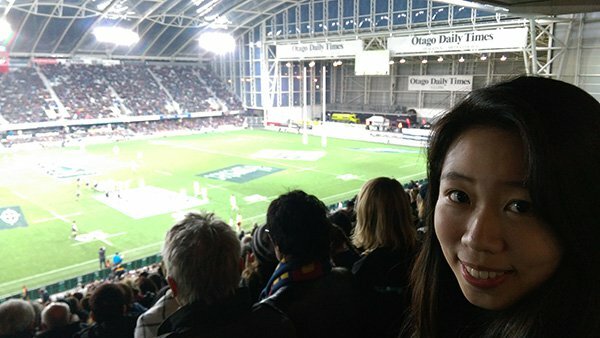 It wasn’t only my first time to watch a rugby match but also the first live sports event I had attended. It’s a home game of the Highlanders versus the Chiefs. 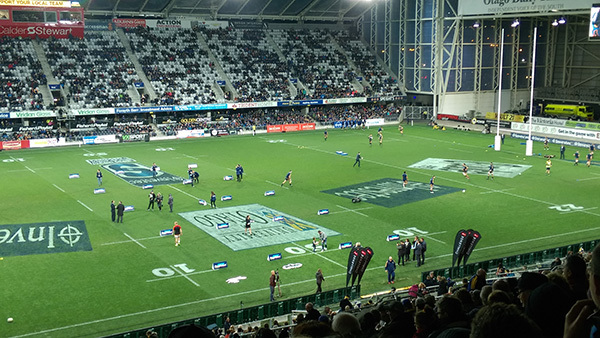 I arrived early at the Forsyth Barr Stadium before seats were all filled as I was really excited. Before the start of the game, the players were on the field warming up. I was a bit impatient to wait for the game to start actually. Not so long, with the sudden burst of screams and cheers, I knew the game was about to commence. The Chiefs had great defence tactics. They led 7-5 at half time which made me nervous until the early second half. The Highlanders then overtook and won 25-15 in the end. Overall the game was so well-played and nail-biting. 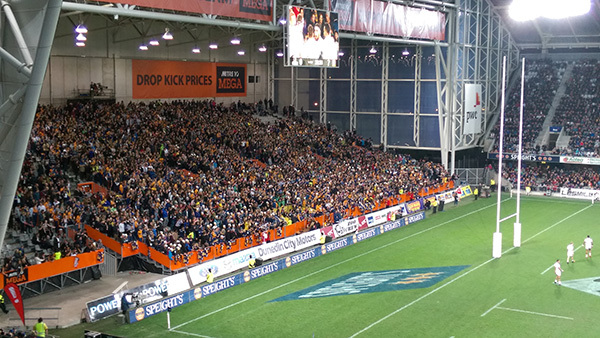 I didn’t feel alone to be a crazy audience screaming for every scoring as obviously the orange wave of people at Mitre 10 Mega Stand were even madder and hyper than me. Some dressed in onesies and danced as their finest. They sang songs that I couldn’t recognise but from the joyful rhythm, I could feel their excitement. The atmosphere was so good, not many hoots for lost points but cheers overloaded all the time. Not only have we got the well-mannered players but also well-mannered fans, don’t we? The home game ended with a delightful champion. I have never thought that my first live match would be such an awesome and unforgettable one. I’m already craving for another rugby home game. I can’t wait for the next match! Next articleWhere Are You Now?